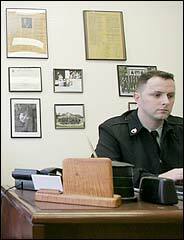 East Orange, New Jersey Army recruiter Sgt. First Class William C. Howard says that antiwar sentiment seems to have grown more aggressive, the insults, dirty looks and other signs of discontent seem to be increasing. Recruiters are on edge and employing new safety measures after a number of increasingly violent incidents including one in which several hundred students at Seattle Central Community College surrounded two Army recruiters on campus, shouting insults and hurling projectiles until the recruiters were rescued by campus security guards who escorted them off campus. A number of recruitment centers have had their windows smashed, painted red, bloodied, sullied with manure, and even firebombed. Recruiters cars have also been firebombed, which makes a worried Sargent Howard wonder "how far is this all going to go."